A story about courage, honor, and regret. Based on the book of the same name, Flags of Our Fathers tells the story of the 6 men who raised the american flag during a furious battle with the Japanese on the island of Iwo Jima. 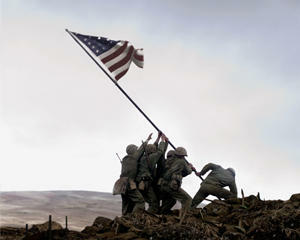 The picture that was taken during the flag raising is one of the most significant photos in American History. It screamed victory and helped win the war. Most of the men that helped were killed in battle but three of them survived. After they returned to the states they travel the country promoting the photo and getting people to donate to the war cause. The war sequences are few and far between and don't really compare to even the most average war films. There are no major battles, mostly just minor skirmishes with small packs of Japanese soldiers. The movie goes back and fourth between the actual fighting on the island and the promotion back home. The set design was fantastic and everything looked very authentic. It just wasn't what I expected from a war film. The cast was pretty well done but they didn't really make me feel bad for them or even care if they lived or died. There was a photo montage at the end of the film and I honestly thought that was the best part. If you see that and compare it to the movie you will see how good a job Clint Eastwood did to make it look as realistic as possible. 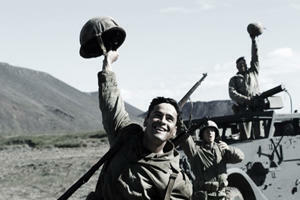 Overall, it was just a slightly above average war film. If you go into it expecting something like Saving Private Ryan or Band of Brothers you will be letdown. 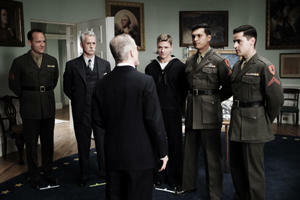 The cast includes Ryan Phillippe, Adam Beach, Jesse Bradford, Jamie Bell, Barry Pepper, Robert Patrick, and Paul Walker. Directed by Clint Eastwood.